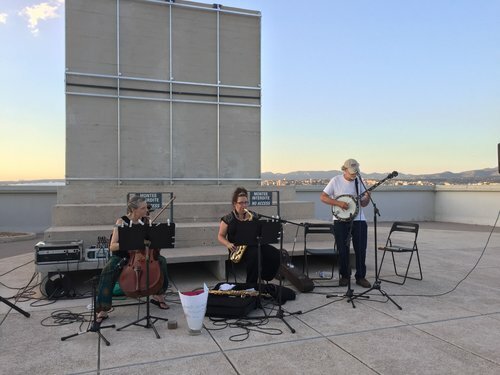 McKenzie, Mayo, and Elwood (MME) is an eclectic international trio with Scottish saxophonist Sue McKenzie, American cellist Susan Mayo, and American banjoist Paul Elwood. They play various jazz, ethnic, classical, and folk-inspired tunes penned by Elwood and Mayo alongside standards by Ornette Coleman and Thelonious Monk, among others. The trio weaves inventive improvisations amongst the diverse sounds of their instruments in what some have called an “enhancive 21st-century folk experience.” In its short life, MME has played concerts in Scotland, France, and Croatia. Sue McKenzie is known for her "infectious energy and moody quietude" (Fiona Maddocks- The Observer) and plays in a variety of contexts both in jazz and classical realms. She has performed at the Glasgow International Jazz Festival, Isle of Wight Jazz Festival, Islay Jazz Festival, Manchester Jazz Festival with the likes of Bill Frisell, the Esbjörn Svensson Trio, and the Haftor Medboe Group, among many others. She is a regular performer at the World Saxophone Congresses in Scotland, Strasbourg, and this summer in Croatia. Paul Elwood is active in the realms of experimental, bluegrass, and jazz. In 2015 he played on a premiere by experimental music pioneer Alvin Lucier and has collaborated with guitarist Jean-Marc Montera, legendary composer Christian Wolff, percussionist Famoudou Don Moye, guitarist Eugene Chadbourne, cellist Hank Roberts, French saxophonist Raphaël Imbert, and the Callithumpian Consort of the New England Conservatory, Zeitgeist, bluegrass legend John Hartford, and pipa player Min Xiao-Fen, among many others. Susan Mayo is active not only in the classical world, playing with the Wichita Symphony, but can also be seen with the WC Quartet, one of the only improvising string quartets in town, Poke Salad Orchestra, a string trio firmly rooted in American traditions, and the 21 Century Projects collective, a creative collaborative of musicians, visual artists, and dancers. She has collaborated on a variety of projects writing works for the WC Quartet and was recently awarded a Tallgrass Artist Residence. This event is sponsored by Friends University, VibrantICT, and the Fisch Haus. Couple of tunes with combined groups.